We are a master distributor for Demag! 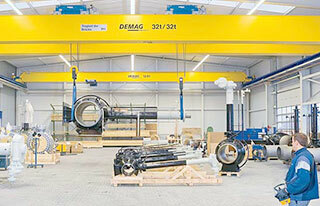 Ergonomic Partners is a master distributor for Demag cranes & components in addition to their KBK Modular Rail Systems. 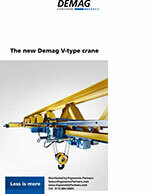 Demag is leader in crane engineering and has vast and industry experience. 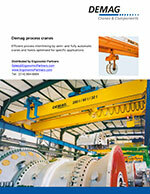 They specialize in single and double-girder overhead traveling cranes. In addition to single and double girder cranes, they can also offer welded box girders to allow for longer span and higher capacity. Connections between the girder and end trucks are manufactured to precise tolerances for minimum wear. Minimum wear due to low maintenance drives. Travel wheels are manufactured of wear resistant CGG 70 spheroidal graphite cast iron. Low deadweight due to optimized box sections. Optional CAN Bus control for ultimate in feedback and monitoring. Rigid Wide Flange Beams allow for optimum load distribution. Flexibility during install when mounting to existing structure. End Trucks can be optimized for the exact service. Maximize end approach allowing loads to get closer to the walls. The double-girder overhead traveling cranes offer exceptional load capacity while maximizing span. This design allows the hook to travel between the girders to maximize lifting heights. Benefits: Manufactured to precise machine tolerances, Torsionally rigid welded box construction, Self-Lubricating spheroidal graphite cast iron wheels, Optional radio control with display and proportional push buttons. 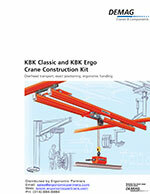 Demag offers single and double girder ceiling suspended and freestanding workstation cranes. Benefits: Modular crane layouts, Smooth handling even at the ends of the system, Rated for loads up to 3.5 Tons. These monorail systems are designed specifically for a customer's application. The ability to add curved sections, track switches, and turntables to allow the customer to route their overhead loads in any direction at any time. Benefits: Routes can be precisely laid out to meet customers' needs, Load Capability up to 7,000 pounds, Ability to transfer loads to adjacent cranes, Direct link between pick up and deposit points. 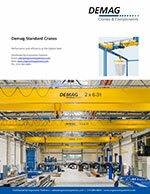 As a worldwide leader in overhead cranes, there is a large offering of Demag parts. As a Demag master distributor, below is a list of items Ergonomic Partners can help you with. Ergonomic Partners is a distributor for Demag Cranes, Components, Parts and KBK Rail systems; serving clients from coast to coast, Canada, Mexico and especially focused in the states of Missouri, Illinois, Indiana, Kansas, Arkansas, Mississippi, Nebraska, Tennessee, Kentucky, Iowa, and Oklahoma.